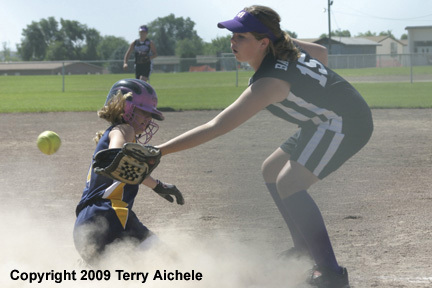 HERMISTON - The Hermiston 11/12 year old Little League softball team lost to Hood River on Wednesday, July 1, 2009. Hood River won 10-6 which tied the two teams in the tournament and forcing an extra game on Thursday. Hood River started off the top of the first by betting the bases loaded with two out. Jessie Karr scored from third on a wild pitch to give Hood River the 1-0 lead. Just moments later Tabitha Merten scored from third on a wild pitch giving HR the 2-0 lead. Kelsey Wells then walked loading the bases again. 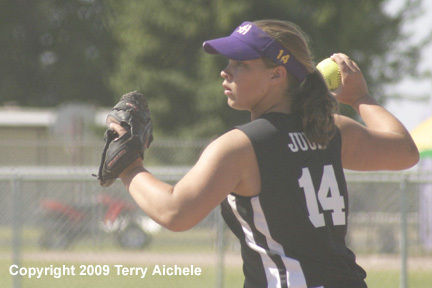 Hermiston swapped pitchers at that point bringing in Mackenzie Juul. Jenni Packer was the next batter and she walked forcing in a runner. Hood River led at the end of the top of the first 3-0. Hermiston started of the bottom of the first with two walks. Kalene Wheeler and Dayna Horn were on second and third when a line drive by Elizabeth Weems hit a line shot that hit Hood River pitcher Taylor Shelton in the leg. Shelton collapsed to the ground and Wheeler and Horn scored before time was called. Shelton was looked over by her coaching staff and the umpires. After getting back on her feet and walking around for a few minutes she went right back to the circle and struck out Kimberly Nevil. Hood River led at the end of the first 3-2. Hood River loaded up the bases again in the top of the second when Breanna Weekly walked forcing in Celeste Martinez which made the score 4-2. A hit to centerfield scored a runner from third. Then Kelsey Wells walked forcing in Tabitha Merten from third. 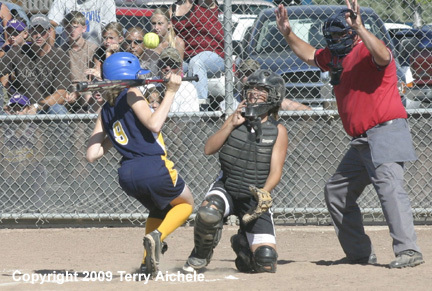 A groundout scored Breanna Weekly from third. Hood River led 7-2. The next scoring came in the top of the fourth for Hood River with runners on second and third. Celeste Martinez hit to centerfield bringing in a runner making the score 8-2. A batter was hit and filled the bases again. Taylor Shelton walked forcing a run in and giving Hood River the 9-2 lead. 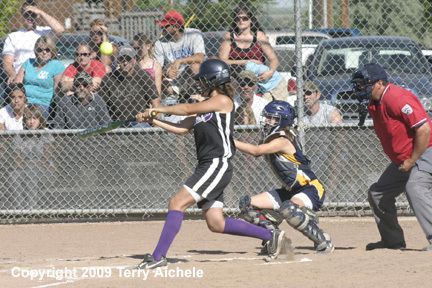 Hermiston scored in the bottom of the fifth when Mackenzie Juul hit to left field scoring Dayna Horn. That made the score 9-3. 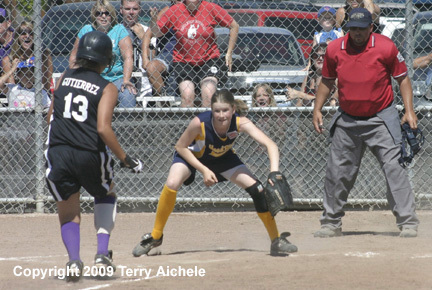 Hood River scored a run in the top of the fifth when Taylor Shelton stole home on a wild pitch. That gave Hood River the 10-3 lead. 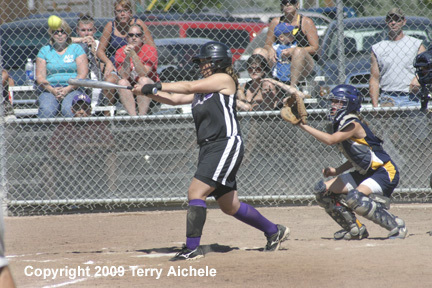 Hermiston tried to get the scoring going in the bottom of the sixth. 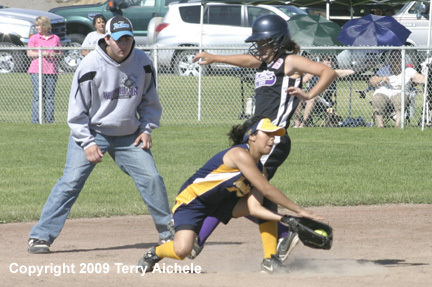 Hermiston loaded up the bases and Kalene Wheeler walked forcing in Amanda Pollick. 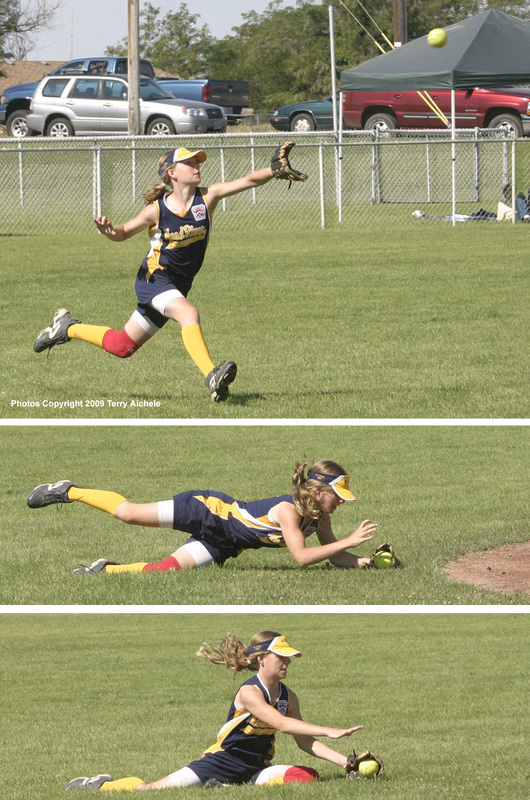 Then Dayna Horn hit to centerfield allowing Jaycee Barron to score. Marissa Crowe hit to centerfield which scored Saige Smith closing the score to 10-6. A flyout to second ended the scoring run for Hermiston.